Heat pumps take available heat from the air or ground surrounding a property and increase it to a temperature for use in the home. This renewable source of heat can be used to create warm air as well as hot water. There are 2 main types of heat pump – air source and ground source, which offer different benefits and vary in cost. Air source heat pumps are more compact and suitable for smaller urban properties, but a ground source heat pump is more efficient and will pay you more via the Renewable Heat Incentive (RHI). Insulation is absolutely key for a heat pump. If your property is poorly insulated, the heat pump will not be able to sufficiently heat the property. Make sure you get you loft and cavity walls insulated to the latest building regulations, or if you have an older solid wall property that you have installed solid wall insulation. What is the cost of a heat pump? An average air source heat pump will set you back anywhere from £5,000 to £10,000, whilst a ground source system will be closer to £25,000. If you need to add in a wet central heating system as well, you will need to tack another £5,000 on to the price, dependant on the size of the house of course. What funding is available for heat pumps? Unfortunately you can’t use the Green Deal to get some help towards the initial cost, the reason being that the initial outlay should be recovered through the Renewable Heat Incentive (RHI) subsidy. The RHI will pay you a regular income for the system over 7 years, in some cases paying back around half of the initial costs, which means that if you can afford it up front, a heat pump can really pay back for you. Your heat pump should be installed in the property along with excellent insulation and ensuring there are no draughts or cold spots. You should also consider underfloor heating for your ground floor as an option instead of radiators, because underfloor heating works at a lower temperature – ideal for heat pump efficiency. This will depend on what you were using before hand, but combined with the RHI the payback should be within 7 years of the initial investment. Air source heat pumps are used to provide heat and hot water for dwellings. They run on electricity, but are incredibly efficient (in some cases 300% or more), which means that for every one unit of electricity used, they produce 3 units of useful heat. If you compare that to a brand new boiler which is 90% efficient (1 unit of gas produces 0.9 units of useful heat), you can quickly see why these systems are so popular. In fact, if you don’t have access to mains gas, heat pumps are definitely the way to go to fulfil your heating and hot water requirements – provided you have a well insulated home which is discussed later. Better still, if you decide to install an air source heat pump in your home, you can also benefit from the Renewable heat incentive, which pays you for each unit of hot water water you produce. In our experience the RHI will cover the cost of installing the heat pump, but it gets paid over 7 years on a quarterly basis, so you will still need to find the money up front. The air source heat pump needs to be located outside in the open air, and uses a fan to draw air into it. This air then flows over a heat exchanger, which contains a refrigerant liquid. An evaporator uses the latent heat from the air to heat the refrigerant liquid sufficiently until it boils and turns to a gas. This gas is then compressed by a compressor, which causes it to significantly increase in temperature. An additional heat exchanger then removes the heat from the refrigerant (turning it back to a liquid), which can then be used as useful heat. There are two types of air source heat pump. These remove latent heat from the air outside the property which is then simply fed into the home through fans. This type of heat pump cannot be used to produce hot water. Air to water heat pumps are by far the most popular – these take heat from air outside the property and transfer this to water that can be used for space heating or as hot water for washing within the house. Ground source heat pumps use the earth as a heat source, taking advantage of the stable temperatures in the ground to provide heat and hot water for the home. 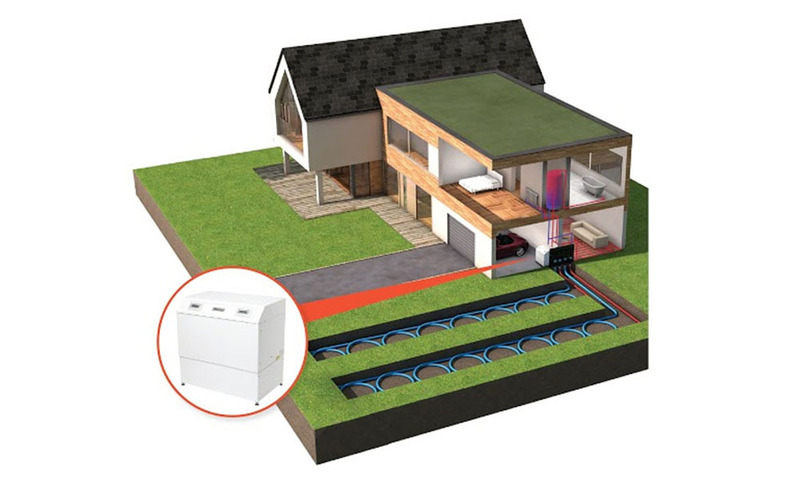 Ground source heat pumps are not a new concept and have been around since the 19th century. This technology became very popular in Sweden in the 1970’s and since then units have been sold worldwide. As of 2004, over a million units have been installed and used globally. 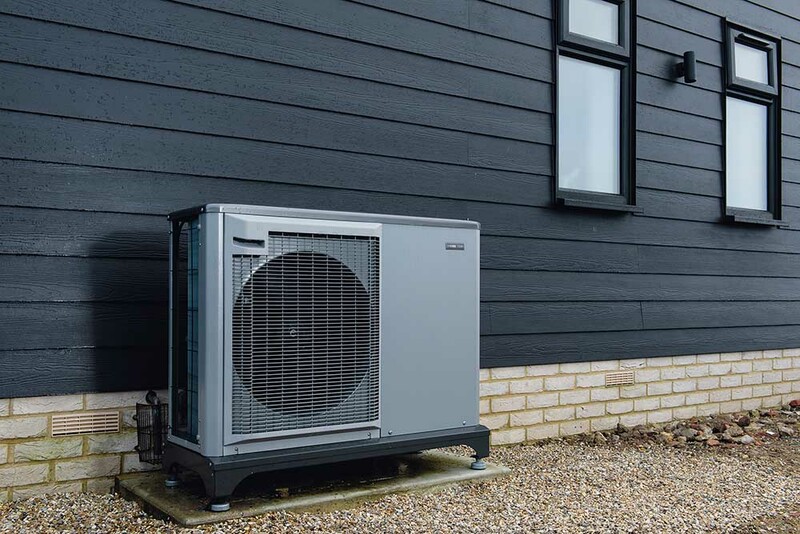 In the UK, there has been a sudden surge in demand in heat pumps because of the launch of the Renewable heat Incentive which pays homeowners for each unit of hot water produced – covering much of the initial install costs of the systems. The low grade heat, transferred through the heat exchanger then passes through a heat pump compressor which drives the temperature up to a level that is usable for heating and hot water.